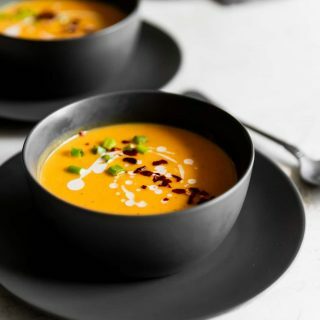 Creamy, dairy-free, and spicy vegan Thai butternut squash soup made with fresh ginger, red curry paste and coconut milk. Ready in 25 minutes! What happens when you marry your love for Thai food to cozy, comfort food? 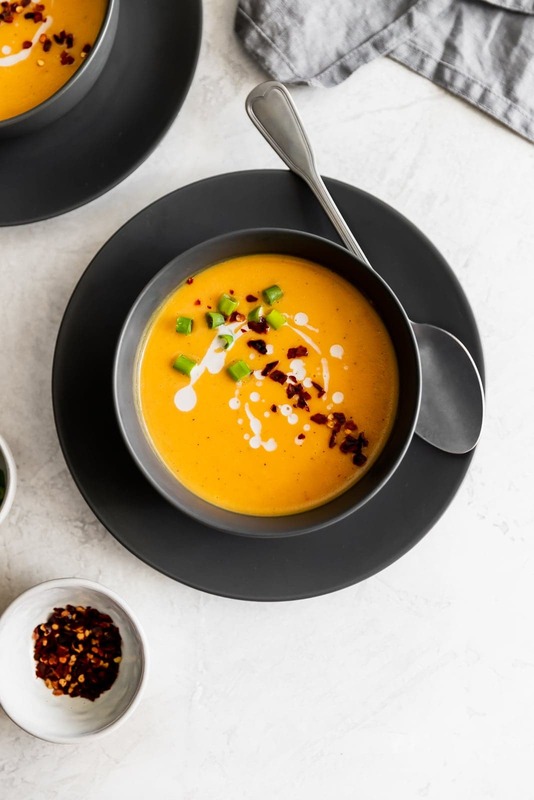 You get a deliciously spicy Thai butternut squash soup! This recipe is so easy to make. It’s the perfect weeknight dinner for the Fall (or any time of year, really). 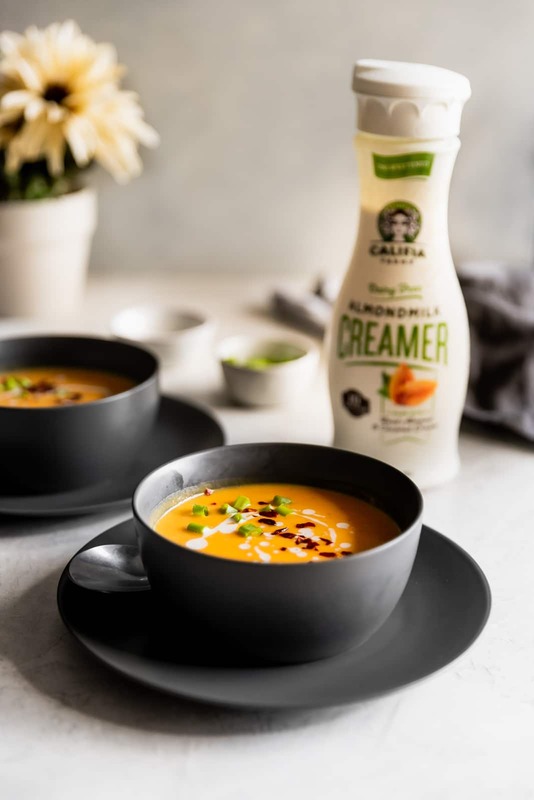 This Thai butternut squash soup is made with creamy coconut milk, veggie stock, red curry paste, and Califia Farms Unsweetened Creamer. 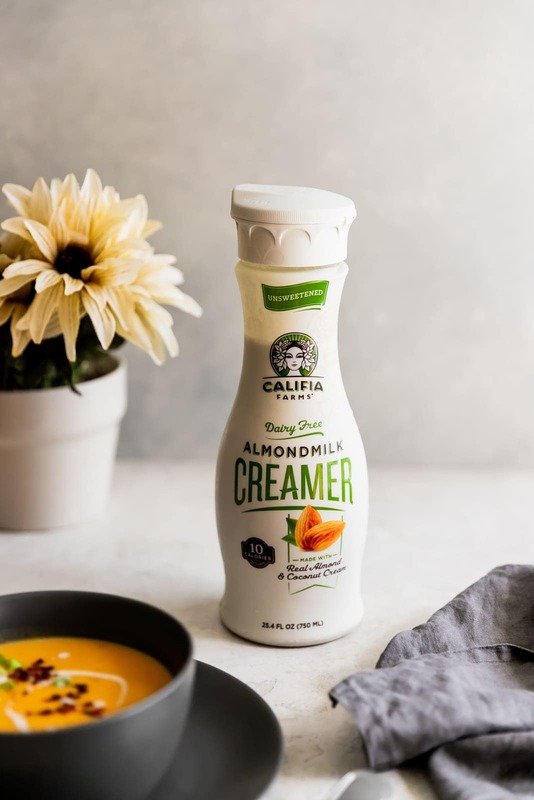 This creamer is soy-free, dairy-free, gluten-free, kosher, vegan, and BPA-free. It’s made with simple ingredients like almond milk and coconut cream. No sugar added. 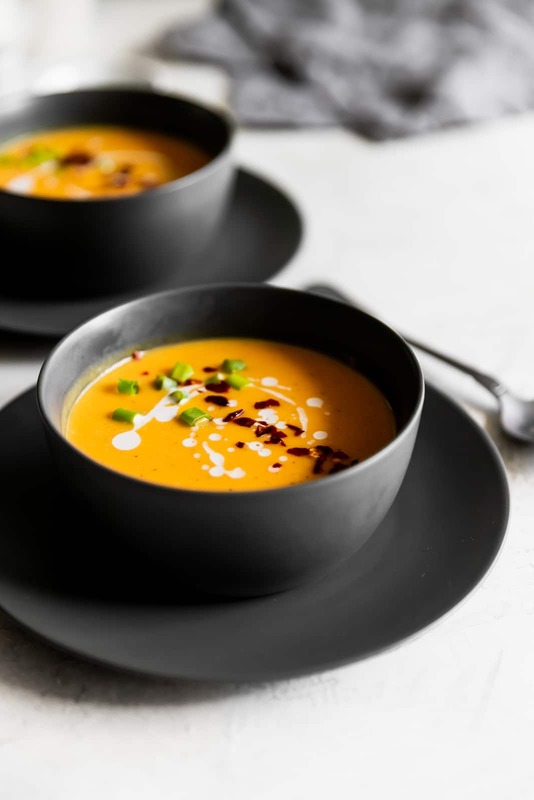 This dairy-free soup is so unbelievably flavorful. I couldn’t resist having a second helping of it! First things first, you sauté the onions and garlic with olive oil over medium-heat in a Dutch oven. Once they are cooked down a bit, add ginger and red curry paste. Stir for few seconds. Add vegetable stock, cubed butternut squash, nutmeg, salt, pepper, Worcestershire sauce, coconut milk, and Califia Farms Unsweetened Creamer. You can use frozen or fresh butternut squash. Either one could work! You can also use coconut cream instead of coconut milk. Don’t you just love versatile recipes like this? Me too! Cover, reduce heat and cook for 15 minutes until the squash has softened. After 15 minutes, remove the pot from the heat and purée using an immersion blender. You could also transfer the soup to a blender. PRO TIP: Make sure to remove the clear cap from the lid of your blender before blending. TRUST ME. It happened to me once. One time, I transferred the soup to a blender but didn’t remove the cap (which releases steam) and my blender exploded all over my kitchen. True story. It wasn’t pretty. This is why I love my immersion blender. 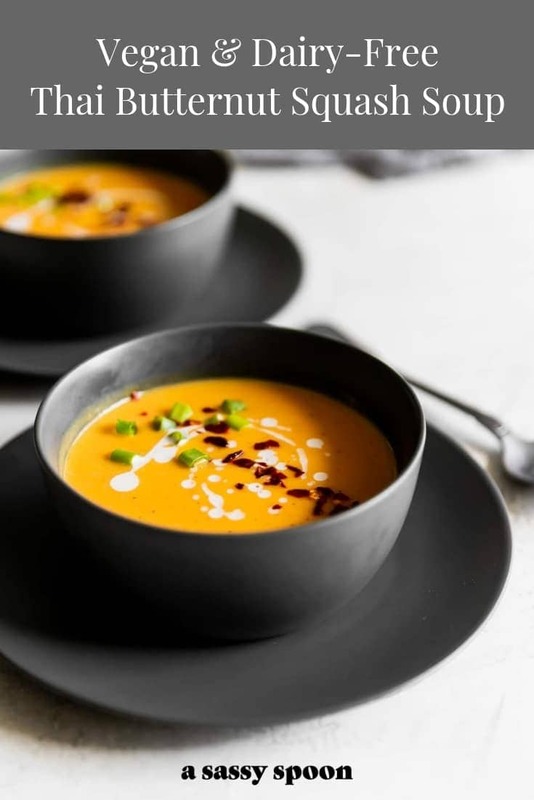 Once blended, serve soup immediately, garnished with green onions, red pepper flakes and a drizzle of Califia unsweetened creamer. How easy was that! In a Dutch oven or large pot, heat olive oil over medium-high heat. Add onions and garlic. Sauté for 3 minutes. Add ginger and curry paste. Sauté for 30 seconds, stirring constantly. Add vegetable stock, butternut squash, nutmeg, salt, pepper, Worcestershire sauce, coconut milk and creamer. Bring to a boil. Reduce heat, cover and simmer for 15-20 minutes. Once the butternut squash has soften, remove from heat and puree the soup with an immersion blender until smooth. You may also transfer to a blender or food processor to blend until smooth. 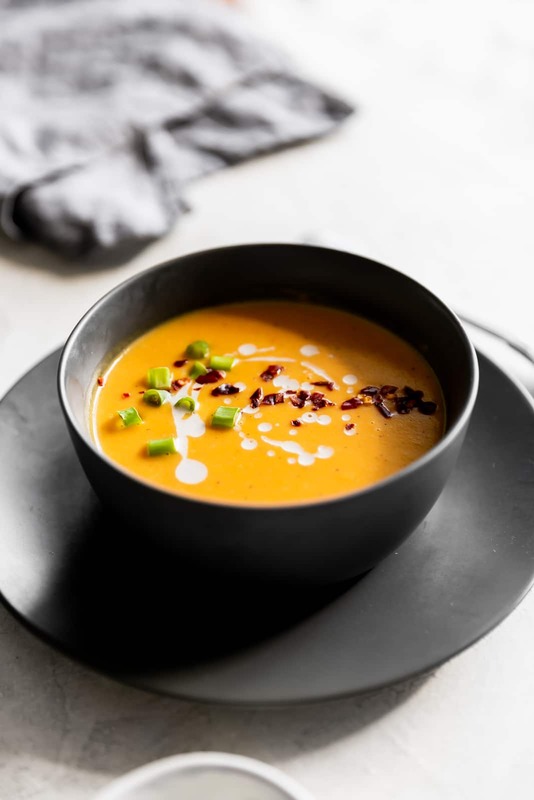 Serve warm soup with a drizzle of creamer and top with red pepper flakes, cilantro, and/or sliced green onions. Enjoy!